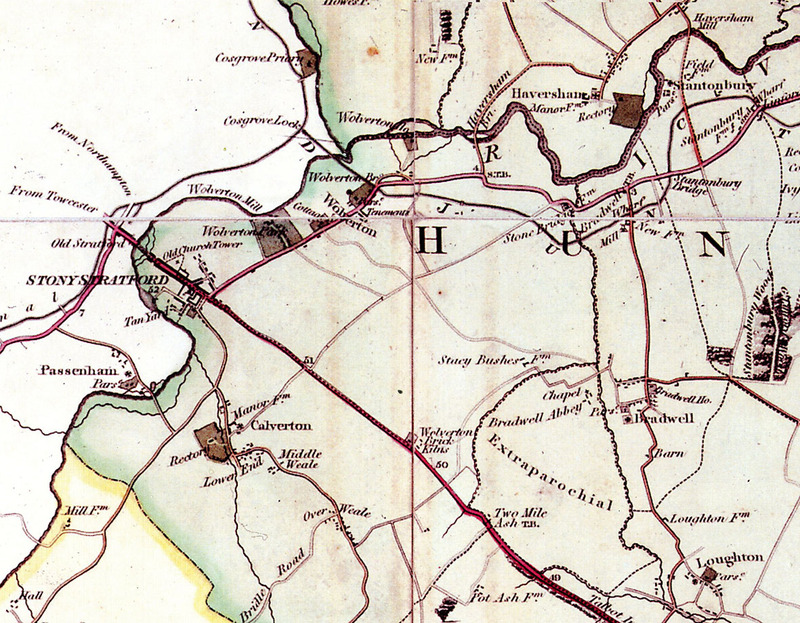 Very little of the Wolverton area from the early 19th century is now recognisable. Even the Watling Street has now been broken up. 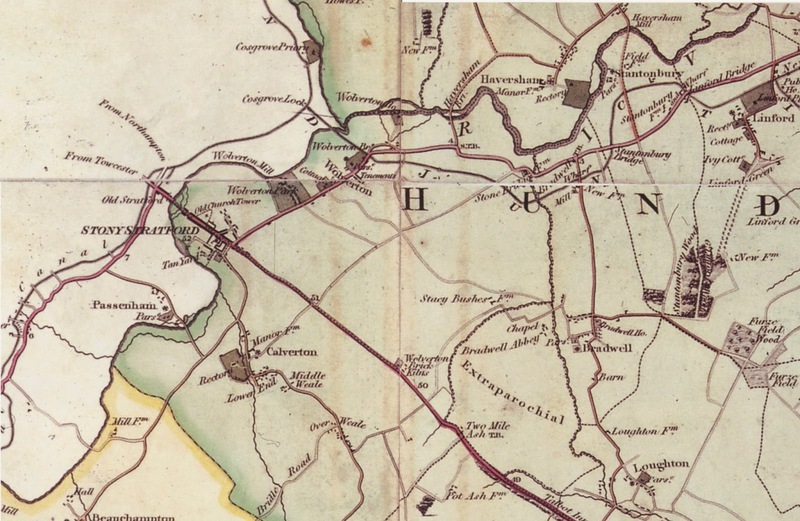 This map was published in 1825 and based on a survey of 1824 by a man called A. Bryant. Little is known about him, not even his first name, but the map survives and pre-dates the Ordnance Survey by a decade. The Wolverton Road followed its old course along the valley. 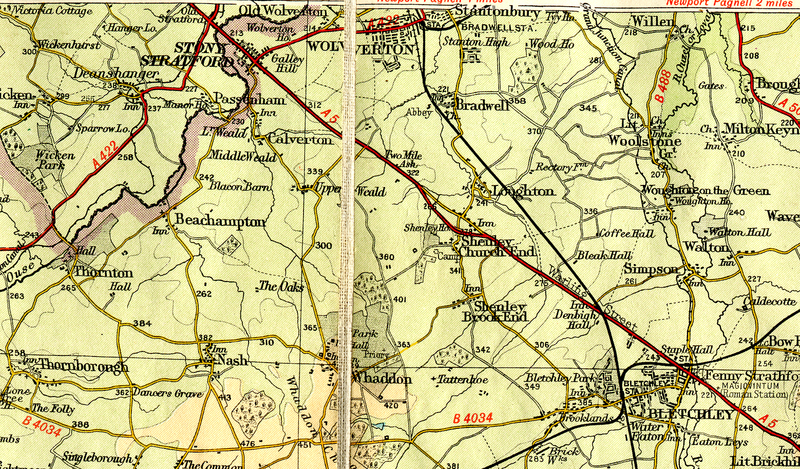 It was at that time a toll road and toll houses were to be found just outside Stony Stratford, at the Haversham turn and at the turn at the bottom of the hill at what was later New Bradwell. New Bradwell did not then exist and houses could only be found by the canal at the wharf, the New Inn and the Windmill. There may have been more people at that time living in Stantonbury. There was a direct track from Wolverton to Bradwell, probably going through the Happy Morn and the Haversham road was in a slightly different place, having been moved to the east when the railway embankment was built. The course of the river was also changed at the same time. Note also the direct track from Stonebridge House to Calverton. This was one of the ancient cross country roads, a ridgeway. Parts of it survive at Wolverton as Green Lane and the track between the Top Rec and the Cemetery. Stony Stratford was also somewhat different. The Back Lane, now Russell street, had houses of sorts on it and could reach the High Street through Ram Alley, which was demolished later in the century to become New Street. The main farms were at Brick Kiln, Wolverton Park (now known as Wolverton House), Manor Farm (marked here as Wolverton House), Stacey Bushes Farm (at the time the farmhouse was beside Bradwell Brook) and Stonebridge House Farm. there were also some smaller farms such as Debbs Barn near Stony Stratford and another farm which was later occupied by McCorquodales ad the western end of the Works. Much of this map could still be recognised by those of us who grew up in the pre-Milton Keynes era, but I rather thinks that as development continues and roads change their course, very little of it can be positively identified today. Here’s a very different view of the Wolverton area. The canal has arrived but the railway is scarcely in anyone’s imagination. The year of this publication is 1825 and was undertaken by a man called Bryant, about whom very little is known – not even his first name. Stony Stratford is recognisable with development along the High Street of course and houses around Horse fair, the Market Square and Mill Lane. There is a tannery away from the residential part. Russell Street has yet to come into existence but there are cottages along what was then called Back lane. Wolverton Park is Wolverton House and most of the land around there was farmed from this centre, although there was a farm house where the house called Wolverton Park now stands. Warren Farm came into existence later in the century. Tanor Farm is marked as Wolverton House. this may have been a map maker’s error. Slated Row was built only a few years earlier and is marked on the map as Tenements. The Old Wolverton Road was there but not known by that name at the time and takes you along the valley to Stonebridge House Farm where it joins the road from Calverton, which at that time could go uninterrupted across the fields. The only surviving parts of this ancient road are Green Lane in Wolverton and the track alongside the Wolverton cemetery. New Bradwell was non-existent and the only buildings were a toll house on the Newport Road, a wharf house and cottages, The New Inn and the Windmill. Stacey Bushes Farm was beside Bradwell Brook in those days. The present house (now the core of MK Museum) was built in the 1860s. On the Watling Street a Mr Wilkinson had his brick yards. He also farmed and the farm was later known as Brick Kiln Farm. Today it is an industrial area known as Kiln Farm. The land in the middle was known as “The Furzes” – hence Furze Way. Fields that were still farmed until comparatively recent times were known as Ardwell, Greenleys and Fuller Slade. These names have been preserved in housing developments. The roads had toll gates in those days. There was one at Two Mile Ash, another at the bridge. The Stratford to Newport road had a toll house just to the east of Stony and there was another on at the bottom of Stantonbury Hill. Each time you had to pay, so some journeys could become expensive. 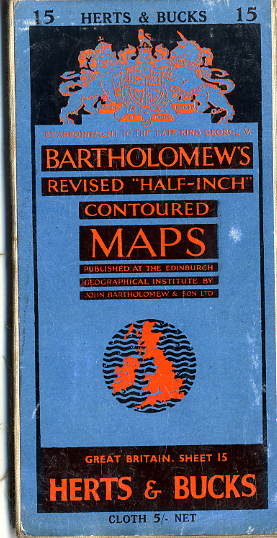 Ferreting around in a flea market in Wimborne today I came across a collection of Bartholemew’s Half Inch Maps. I loved these maps when I was young. They were easy to read and detailed enough for a cyclist and the scale meant that they covered sufficient territory that one map was all you needed to take with you. The contours were coloured so that you could take in the terrain at a glance. Contour lines on OS Maps were always the same colour and sometimes hard to read. The other nice feature about these maps was the mounting of the printed paper panels on cloth so that they could be folded without damage. This map is dated 1957 and originally cost 5s – 25p in today’s monetary translation. My original disappeared years ago, so I replaced it today for £2.50! Here we have the Milton Keynes area pre-Milton Keynes. It’s all very rural. Coffee Hall and Bleak Hall were just farms. Willen, Broughton, Milton keynes, Wavendon, Woughton, Walton and Woolstone were all tiny villages. Only Bletchley was growing. The land between Bletchley and Fenny Stratford had been infilled and new estates had been planted at Denbigh hall, Beltchley Park and Water Eaton. Galley Hill at Stony Stratford is curiously marked, although it was open fields. The Old Wolverton Road had no industrial development. Wolverton itself shows the extension of Windsor Street and Gloucester Road and Marina Drive. You can also see the Bradville Estate where it says Stanton High. All in all, a very underpopulated part of England compared to the present.